Before today's session started community participants installed posters and other materials in the Shamba. The agenda opened with a reflection and recapitulation session. This provided the participants with the opportunity to revise the lessons learned from the Saturday discussion and offer suggestions for the day's agenda. Afterwards Robin Marsh, Academic Coordinator for University of Berkeley's Center for Sustainable Resource Development, led an exercise on institutional mapping. This started with a presentation by Senegalese representatives from the national government as well as from community associations. Then participants divided into groups to discuss different issues on the institutional environment that surrounds community based initiatives. They focused particularly on the challenges that remain to establish policy frameworks more supportive of local efforts oriented to promote both biodiversity conservation and poverty reduction. Community representatives took part in each of the themes' presentations. 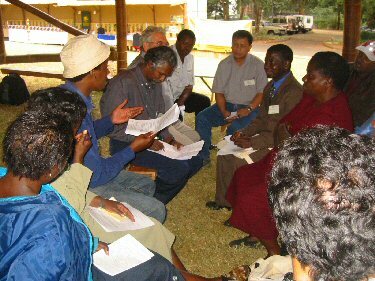 Afterwards they created groups to discuss strategies to mainstream key messages resulting from the Shamba forums into the ecoagricultural conference. Finally, participants ended the 2nd day of the workshop reporting and discussing key themes developed in small groups. These consolidated messages will open the Conference in Plenary tomorrow.